Skateboard Games That Keep You On Board. There a are ton of skateboard games to play. Now that you know a lot of skateboard tricks, what do you do with them? 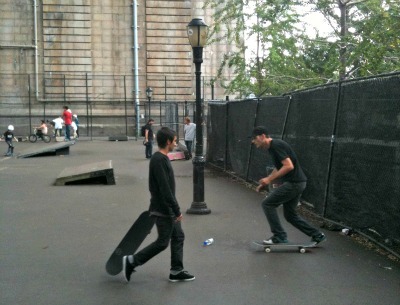 Play games like skate or best trick with your buddies. Video games and online games that let you skate no matter how good you are at actual skateboarding. Some skateboard games keep you on your board more and some make you skate less. In the case of some video games, sometimes waaay less. Get On Board With Your Friends! Then Skater 2 must do the same trick. If Skater 2 misses they get a letter. Then Skater 1 sets another trick. If Skater 1 misses then Skater 2 sets the trick. The first skater to get all the letters in SKATE losses. Last trick gets two tries. I do one trick then you do it too. I do two tricks then you do the two too. I do three tricks then you do all three too. See how many tricks you can add together. Keep adding until one of you misses. Set up a course for skateboarding and judge contestants on how well they skated. Contests get people out to watch skateboarding. They are mostly for watching and not really for participating. Good for getting you excited to skate but not so great for letting you use all the excitement to skate. An open skate event where contestants and non contestants can skate at the same time. Skaters will skate and do their “runs” in groups. During a heat only those competing skate. In between the heats the course turns into a free for all of skating energy. Totally fun. You get to participate even if you are not a “pro”. Sort of like a Jam but only on one obstacle. Skaters try to do the best trick on the one feature. This makes it easier to judge and compare the tricks. Creativity can really take the cake with this one. This works well in a bowl or flow area. As many skaters as possible all start skating at the same time and the last one still skating is the winner. The tricks don’t really matter. It might get rough; just try and keep shredding. This will tire out almost anyone and is usually pretty crazy. You roll a set of dice that have the names of tricks on them. Then you attempt the combination. The rules vary. Just like Simon Says but you have to use your skateboard for all the moves. Good for little kids or skate camps. Do tricks on any obstacle first try. Keep going until you miss a trick. The major players in the skateboard video games have been Tony Hawk Pro Skater and EA SKATE.It was a pleasant surprise to the makers of Tony Hawk Pro Skater that it appealed massively to gamers as well as skaters. It was such a different type of game it just caught fire. Skateboard games don't really have goals. you just skate around and around doing tricks and combos. So addictive and so fun in the winter months when you can't get outside. THPS revolutionized skateboard games and gaming itself. It was the first video game to make skateboard feel good enough to be fun. The surprize was that other gamers who didn't skate found it fun to. Yet another revolution. The Flick-it controls gave you the feel of skateboarding’s pop. You use the sticks on the controller to actually pop or flick your tricks.This game honed in on an even more realistic skateboarding feel.It’s my favorite on a cool rainy no skatey night. This new game is just coming out. It looks like it my be more fun for gamers with a unique twist on the skateboard genre. Skateboarding well in the game changes the quality of the levels. leaving you with full colour fun. There are others over the years but these were the only real standouts. Here are some free online games. You may need to install a plugin to play. Something like Flash or Shockwave. Some of these are not so great, others are kind of fun. Just waste away the afternoon at work. If you get caught don’t blame me. A Game has a bunch of online skateboard games. Skateboard Gamez has a few more fun time wasters. Don't Forget to Actually Skate! Sometimes I get too lazy to skate cause of all the gaming options. This is bad news. Always remember that skateboarding for real is WAY better than playing games. The addictive nature of really good skateboarding games can make that hard.